Great Exercise, Fun, and Free--Tennis Everyone! Are You A Reader? Then Shelfari Is For You! After seeing the video I took of me trying to pet Manny unsuccessfully, Wendy, President of Kitten Krazy and my friend told me I was doing a few things wrong. (View video in my earlier post, "Bringing in a New Cat,") If you're in a similar situation, I thought this may help you too (I know I'm not the only one because I've seen at least one other similar video by someone else). 1. Don't talk at all. If you do, keep your voice even--not real low (cat perceives that as you growling at him or real high because cat perceives that as threatening). 2. 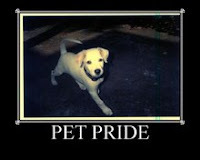 Give him a special treat, some canned food. 3. Play classical music for him through the day. 4. Let him watch a "cat" video or DVD with fish or birds to entertain him. 5. Don't stand up nearby him. He's already scared and that just makes you even scarier! 6. Don't make direct eye contact with cat--they perceive that as threatening as well. Blink eyes at him, look at him sideways or just ignore him even. 7. Spend time in the room reading near by but don't pay any attention to cat. Eventually they come around once they know it's safe and you aren't going to hurt them. Results after doing most of these things (all except food treat--he didn't want it and the video/DVD): Over the next few days he quit growling at me, just hissed once when I came close. Big Progress When I got home from work I read in Manny's room 40 min. He laid nice on desk for a bit, not even swishing his tail. No hissing or growling. I cleaned his box, gave him fresh water and I sat on chair and read. He jumped down under the desk and laid awhile. Rolled on his back in middle of the room and groomed himself. Walked to the door and sniffed a bit. Ate while I was in there. I refrained from trying to pet him, but wanted to. Friday, May 30, 2008: Sniffed My Hand! This morning when I went in to visit with Manny, I read the paper as usual, then read a book sitting at the desk while Manny moved freely around the room and settled next to my chair. I just hung my hand down and he came and sniffed it. I refrained from trying to pet him. I do believe he's coming around. I left to do something and came back in. Manny was sitting on the desk sniffing my book. When I went over to read some more, he hissed at me. I guess I interrupted his reading . . . oops. Saturday, May 31, 2008: Wendy meets Manny & helps us pet him. But the next morning, he was Manny back to his grumpy self and didn't want anything to do with me. I'm not good at being nice Alpha Kitty. Finally, Sunday we had success! I left Manny and Spunky both free after they explored each other's rooms for an hour and they bonded somewhat. Manny finally came to me for petting for the first time since we had him, and he was like he was the Friday when we first met. Hurray! That made my day!!! He and Spunky get along pretty good too. See how close they are here in this picture? Only about 4-5 feet apart and not hissing or growling! YIPPEE! 1. It's easy and fun! It only takes two people. Even old people like me can still play. Just need a racquet and some balls. Always keep your eye on the ball AND on contact point a split ssecond after impact (like golf). Bend your knees, especially on low balls so you can keep the head of your racquet above your wrist. Go for everything if you think it might be in, even if you don't think you'll make it--sometimes I surprise myself and am constantly surprising my husband at what I can get to. Know where you want to hit the ball BEFORE it comes over the net--plan ahead and be aggressive! Keep the ball in the court--make your opponent EARN their points! Start your backswing early to get in position to make a good shot. SQUEEZE the racquet as you hit the ball. Attack the ball whenever possible, don't wait for it to come to you except on the high ones, then wait and step back rather than try to jump to hit it. Stroke THROUGH the ball, don't bat at it. On your backhand, lean into the stroke toward the net, keeping your wrist and elbow locked. Now, don't just sit here on the computer reading blogs and making drops all day when it's a beautiful day outside. Get out there and enjoy it! Give tennis a try! Make friendship and exercise the priorities and winning third. HAVE SOME FUN!!! It always makes me smile when the researches make "new" discoveries that God has already long before included in His Word--The Bible. Today is a good example in THE PLAIN DEALER on health: "Doctors say you really can laugh your way to better health." God's word says in Proverbs 17:22: A merry heart does good, like medicine, But a broken spirit dries the bones. I love to laugh. In fact, it was one of the reasons I was attracted to my husband in the first place--he has a knack for making me laugh. My dad made me laugh too because of the funny things he used to do. When my cat was a kitten, she would do something just about every day that made me laugh. If you want to laugh every day, get at kitten! I don't read all the comics, in fact I skip most of them, but I do generally chuckle at Family Circus, Garfield, Peanuts, and Hagar. As far as TV shows go, these are the ones that make us laugh: Everybody Loves Raymond, The Bachelor, Wife Swap and Moment of truth all make us laugh and sometimes Seinfeld. Funny emails that people forward to me make me laugh. For a funny post about her teenage son entitled "Dude, Where's My Son" go to http://jackiepapandrew.pnn.com/. She also has another blog as well called "Airing Dirty Laundry, the Blog" at http://www.jackiepapandrew.blogspot.com/. Go to cleveland.com/healthfit and cleveland.com/medical for health news you can use. One of the places Gerard and I often go is to the Cleveland Zoo. It is very big and the exhibits are spread out so it's a great place to walk and get some exercise. Before I was married, I'd often go alone just because it was safer than walking alone on the streets of Cleveland. I love animals and have taken many, many pictures of them over the years but have included a couple slide shows from 2007 that I recently made that are at the bottom of my blog. On May 17, Gerard and I participated in the Great Strides walk to help raise money for Cystic Fibrosis research at the Cleveland Zoo. A friend of ours has a 3-yr-old daughter, Cassidie, with this disease so we walked on their team. Cassidie's Crew raised almost $9,000! View the video about Cassidie and her family dealing with Cystic Fibrosis by Clicking on this link: See Cassidie's Crew Great Strides2008 online. Here's a video of one of my favorite animals, the Red Panda, and Gerard's favorite, the tiger. Both these animals usually just lay around but this time they were very active, perhaps because it was on the cool side in the upper 50s. This is the first look we had at the baby Red Panda that was born in our zoo last year. I think these are so cute and would just love to pet them. They have sharp teeth. The flip video camera I got for mother's day is so easy to use and small to carry. The tigers were walking around and even playing with each other. 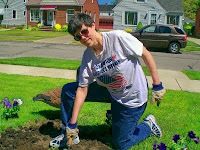 Each year Gerard and I look forward to planting flowers in our yard. Before we were married, he always used to have great roses and pretty flowers, one of the best yards in his neighborhood! Planting flowers was new to me. This is something that I got into since knowing Gerard. 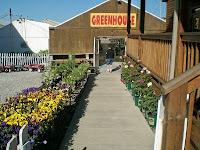 We like getting our flowers from Richardson's Greenhouse which is only about 15 minutes from our house. Not only do they have beautiful flowers and a huge selection, the they are very nice people who run it and they have a greeter--a friendly calico cat! He's about 16 years old now and lets the customers pet him. He usually just sits or lays near the cash register. That's another reason we like to go there. Here's Gerard with our loaded wagon. 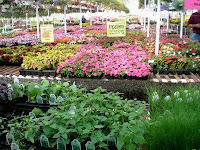 We are getting Coletus, purple & white petunias, a geranium for the front porch and top soil. (Getting the dirt ready is Gerard's job too.) Then hanging plants are gorgeous, but since we took off our awning when we had the new roof put on, we have nowhere to hang one. We plan to buy the mulch from WalMart and do that tomorrow. Gerard and I both enjoy doing this together, but he works much faster than I. He had the swans and the flower box all done by the time I came out after saying "hello" to our cats first and having some yogurt and a drink of water. He doesn't fuss around! I, of course, have final approval. Gerard put the coletus in the swan pots and petunias and coletus in the porch flower box. I told it should all be petunias in there, so he replaced the Coletus with petunias. 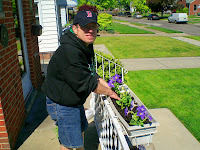 We both worked on planting the Coletus and Petunias in the flower bed in the front yard. I dig the holes and he plants the flowers. That way, we can work well together--he lets me do the arranging and he's the one who gets dirty. We also planted some begonias and Coletus in the backyard. The begonias are near the house in our sunniest spot (called Dickie Bird's Garden because our bird is buried there) and the Coletus is by our Miracle Moe cat's grave in the back corner. 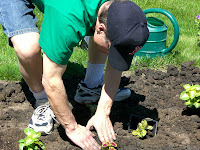 To hear a planting tip from Gerard, view this very short video. Once you join, you can view the shelves of other members to see what they've read, how many books they have in common with you and what they are, add book reviews, participate on forum discussions about books as well as other topics. There are tons of discussion groups. You can add friends and drop notes or email them. I don't know about you, but when I finish a good book like Redeeming Love by Francine Rivers, or a baffling book like The Life of Pi by Yann Martel, I want to discuss it with others who've read it. On Shelfari, it's very easy to do because one discussion forum is called "Book Chat" where you can discuss any book you want! Or, you can click on the book on your shelf and then find out who else has read it and send them a note or email or friend request. If there's a book you think you might like to read, you can also ask the Shelfari Members if they think you should read it or not and all those that have it on their shelf will get your inquiry and some will respond back to let you know what they thought of it. Another nice feature is a special author page where you can discuss authors and find out more about them. I have about 25 books I plan to read now that were either discussed or recommended to me on Shelfari. If you love to read, this site is for you! Check it out and let me know what you think. Then, send me a friend request. I'd love to be your Shelfari friend! My new year's resolution this year was to be a blessing to someone each day. Some days go by that I think, well, I can't really think of who I blessed today, but today is not one of them. I take the bus to and from work everyday with pretty much the same group of people. I am a quiet, reserve person, and usually just stick my nose in a book when I sit down and keep it there until it's time to get off. Yesterday was no different, but as I was getting off, I saw a hat in the seat where one of the regular riders had sat. My mind flashed back to when I left my umbrella on the bus and never did get it back, so instead of giving the hat to the driver to turn in to lost and found, I picked it up and took it with me with the resolve to give it back to the gentlemen in the morning. Today when I brought the hat back, the man's eyes just lit up and he was so grateful that we even had a nice chat! His first words were "God is good." He told me he prayed that God would bless the person who took it and that he would get it back. He said prayer works and is powerful. I said I knew and told him I was a believer too. It turned out he knows my brother-in-law and was neighbors with a couple I know from church. Is there something in your life today that you are concerned about--turn it over to God in prayer! Now go and be a blessing to someone today! Mother's day is always a bit tough for me because my mom went to be with the Lord. Her name was Lenore. She was a wonderful mother and I loved her so much. Although I wrote "My Funny Dad, Harry" about my dad, I was actually closer to my mom. We always got along well, even through those teenage years. Growing up, I thought my parents were over protective, but looking back, I see they just couldn't help it--they loved me so much. It was my mom who encouraged me to try new things. She got me a puppy to get me over the fear of dogs, paid for piano lessons because she never was able to have any, taught me how to do puzzles, play games (she especially liked scrabble and Canasta), shared her love for reading and baseball with me, and watched movies and Guiding Light together too. She was my biggest supporter and gave me good advice about what classes to take in school. I took business classes along with the college prep track and after trying teaching for a year as a sub, became a legal secretary which is what mom thought I should do all along. I remember we'd stay up late and talk and talk about everything (sometimes until 2 or 2:30 a.m.)! She was very easy to talk to and always was a good listener. She let me lean against her like a big pillow. I wish I started reading books sooner because now as I read, I wish I could discuss them with her. She never used a computer, but when I go on pogo or Shelfari, I always think how much she would enjoy those sites as well. She was always a Sunday School teacher as long as she was physically able and I saw her love for the Lord. We lived in a suburb and moved to the city to be close to the church so us kids could be active in the youth group since she did not drive and my dad worked second shift. I was on the reserved side personality wise but when the youth group started a quiz team on books of the Bible and quizzed against kids from other churches within our denomination, it was my mom who again encouraged me to participate. I loved it and was good at it! 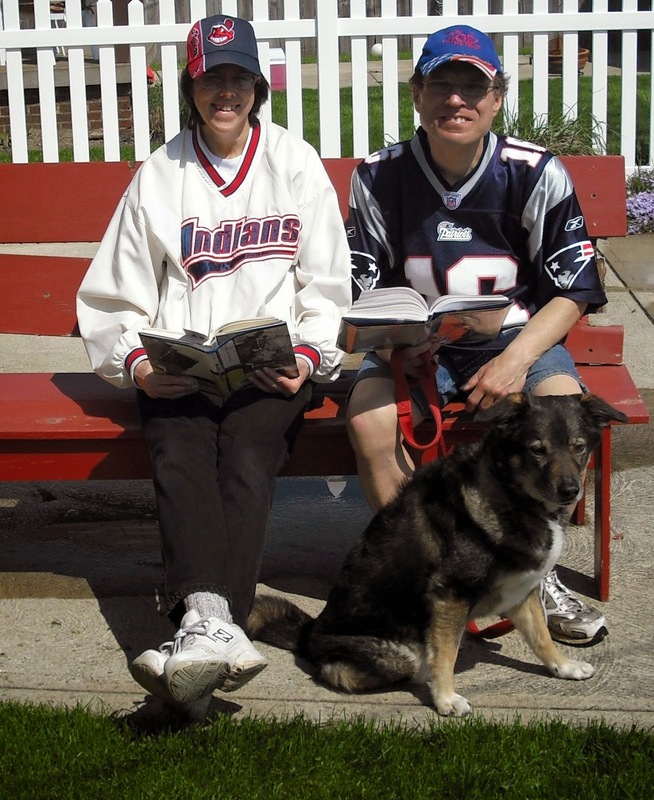 Later, when I was a youth group leader, I got quizzing going again and was the "coach. "She let me be her helper when she did crafts with kids in our hobby club at church and later when she worked with Jr. Highers, again she let me assist her. We were different in many ways. She was heavy set, I was always thin. She was very emotional and sensitive, I was more even tempered. She could sing, I couldn't carry a tune. She loved to read, I only read what I had to for school, if that. She sewed and did needlepoint, I wanted nothing to do with it. On the other hand, we were usually on the same wave length and would laugh at the same things. She would have some fun with her false teeth by pushing them out sometimes, just to make me laugh. She always talked about writing a novel but never did, I am the one who wrote the book. I teach Sunday School now just like she used to. There's so much more I could write, but I don't want this blog entry to become a book, so I'll just stop here. I still think of her often, especially on Mother's Day, but really just about every day. Mom died of congestive heart failure Dec. 2, 1999 at age 75 which I include in my book "My Funny Dad, Harry" to show what a wonderful husband he was. I am truly blessed to have had such good parents and I miss them both, love them always. Be sure to be nice to your mom and cherish the time you have with her. When I read in the news about people getting shot during arguments, it just seems as plain as day that people should not be permitted to own guns. I know, all the hunters get riled when they hear this, but isn't the value of human life more important than hunting for pleasure? IT SHOULD BE! Anyway, the latest here is the story of neighbors not getting along. One is a firefighter, family man with a young child. The other are people who like to party and have some fun. On the Fourth of July, the "partiers" were shooting off fireworks late at night while the firefighter's child was trying to sleep. In the firefighter's own words, "I snapped." He got his gun, went outside and killed three people and shot two others--just like that. I can't help but think that if he didn't have a gun, three people would still be alive today and the other two would not be wounded. Furthermore, the firefighter (Hough) would not be in jail away from his family facing the death penalty. The families of the victims would not all be grieving. The firefighter was convicted on three counts of aggravated murder and two counts of attempted murder. He received a sentence of life in prison. This is just one episode, it happens a lot! People always get angry, it happens. But without a gun in hand at the time, the consequences would be far less severe. I would not have a gun in my house, ever! If you have one, please rethink this and don't take the risk of something similar happening to you. A couple good fiction books about this topic are "Nineteen Minutes" and "Perfect Match" by Jodi Picoult. I highly recommend them both! Related Article: "Alternative to Over Crowded Prisons" by Karen Zemek on http://karen.pnn.com (politics section). Over and over I hear about more gun related accidental deaths. A friend shoots her friend, a 4 yr. old shoots his older brother and on and on it goes. The 4 yr. old even announced he was going to get a gun and his family assumed he would come back with his toy gun. They were wrong. He loaded a real gun that was in the house and came back out and shot his brother because he had stood on his foot! Turn your volume up so you can hear Manny. Well, it's been 4 1/2 months since our cat, Moe, died and we still miss him terribly. I think our other cat misses him too, but can't be sure about that. I asked Spunky Doodle if she'd like another cat friend, but she won't say one way or the other. I've been praying about whether we should get another cat or not and decided not unless the perfect cat showed up. I was thinking about a cat about Spunky's age, a Tabby, with front paws delawed like her. I got an email from a friend of mine the other day and guess what! She is giving away her friendly, male neutered Tabby with front paws declawed to a good home. It's just what I thought I'd like and am going to meet him tomorrow night. His name is Foofee. Things are going smoothly now with Spunky Doodle following us around like a dog and sleeping on the bed with me. My husband is leery about the idea. I am very optimistic though, because Spunky took so well to Moe. She just wanted to play. The other cat who is coming from a one-cat household may not want to be with another cat though. We'll see. Time will tell. Gerard and I went to meet Foofee were amazed at how friendly he was! He greeted us in the living room when we first came and never left. He let us pet him the WHOLE TIME and even rub a sock to get his scent on it to take back for Spunky Doodle to sniff. I hope he likes our home. We'll be bringing him home tomorrow. Today's the day we bring in Foofee, but we've already decided to change his name to Manny (since we got him in May and he'll be staying in Gerard's "man cave" room upstairs during the adjustment period). Getting him into the carrier was no easy task, but once he was on the way, he was very quiet. He has his own private "safe room" for now. I spent a little time with him but mostly let him be by himself and relax and explore at his own pace. When I went in to check on him later, he was lying near the door with his paws curled around him in front of him looking scared. Then after awhile, I checked again and he was laying next to the carrier in the corner. He had quite a scary, bad day. Hopefully things will improve for him. Sunday, May 18, 2008: Relief! This morning I went in with him around 5:45 and he was out of the corner and up on the desk looking out the window. I approached very slowly, gave him new water, checked his litter box (still not used) and then sat down and read out loud so he would get used to my voice. I didn't want to spook him. I noticed we had been in the carrier during the night because the towel was crumpled up--that's a good sign. I'd like for him to get used to that carrier. After about 30 minutes, I brushed him a little bit. He didn't seem to mind. Then I pet him gently on and off for about 15 minutes. So far I've been successful at keeping Spunky out but found her right outside his door this morning. She's curious, of course. But not growling or hissing . . . yet. After church, he was back in the corner behind the carrier again and didn't come out while I was in there. I left and popped in about 10 minutes later, and saw he had moved to check out the bottom built-in shelf. I felt better. This morning I was encouraged to see he used his litter box for the first time since we brought him in. He hissed at me though when I went to brush him and he also hissed at Gerard. The good news is he started to eat some during the night. We're finally showing a little progress. I saw he was in the carrier again during the night because the towel was a bit crumpled. Manny moved around the room this morning with me in it. He started walking toward me when I was laying on the floor on the opposite side of the room. I started getting excited, thinking he was coming to me, but no, he went around to the side of his litter box and hopped up on it and then up to the desk. He was laying nice on the desk and I started to brush him but he hissed so I quit that. I touched him with one finger and he didn't hiss that time. When I moved his food dish up next to him and backed off, he looked at it and I thought he would eat some more, but he didn't. Then he jumped back off and down to his corner, so I left and will go back in to read the paper. He stayed in his hiding corner all the while I read the paper, but he watched. When Gerard got home from work, he found Manny hiding under the tall dresser! It's really low to the floor, but at least he's finally exploring the room. When I went up this morning, Manny was STILL under the dresser. He did eat some during the night though and used his litter box. I took out the bottom drawer so I could pet him easier. He jumped out right away so maybe it was hard for him to get out from under there and that's why he stayed so long. Who knows? I was happy to see he was on the desk by the window when I came home and stayed there even with me in the room without going to the corner or under anything. He's finally beginning to come around. This morning I was soo pleased to see the one side of his dish practically empty! Thank God he's eating!!! He was up on the desk when I went in this morning and let me pet him a little, even though he hissed some. My friend at Kitten Krazy told me I should still pet him even if he hisses because otherwise he gets his way and I'll never be able to pet him. He'll just keep doing it. I am optimistic now. I also noticed that he moved the sock I left with him that had Spunky's scent on it. At least he acknowledged it. I rubbed another sock on him, he actually let me, to get his scent on it for Spunky. When I gave it to Spunky, she hissed! That's a good thing because it confirmed his scent was on it. I linked this old post up to Mama Kat's Writers' Workshop this week because it answers the prompt: "Tell how your pet became a member of your family." I just got a new flip video camera for mother's day and am learning to use it. These are pictures I took with it today. 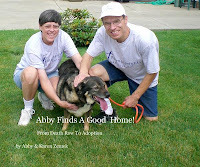 I'm so excited that I discovered how to email video clips, save as pictures, and upload clips to my blog or You Tube. These are video clips I took today. This is Gerard (my husband) & Leo the Lion! Here's Gerard crossing the overflowed bridge. Here comes a man walking his dog. One of three dogs we saw today, a 4 yr. old Siberian Husky. I also made a little movie of them, but haven't yet figured out how to save the movie to my files. Nor have I yet figured out how to email a movie or upload it to the Internet. If anyone could explain this to me, please leave a comment telling me how to do it. I'd appreciate it! I did learn how to put various clips into one movie and save to my computer. You go to START on your computer and choose "run" and type in "moviemk." When you enter, you then can import video (or photos) and drag them down to the movie bar at the bottom. My Flip videos go into a subdirectory under "my videos" which I finally discovered after some time.